Would anyone fancy some free chocolate? Maybe it's the cold weather. 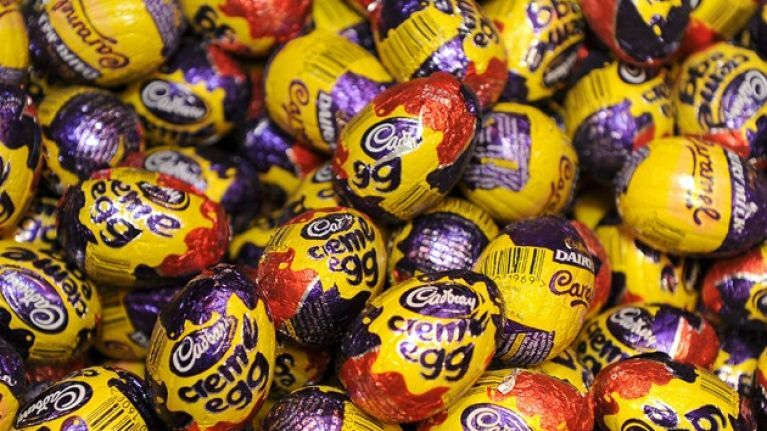 Maybe it's the fact that Cadbury Creme Eggs are suddenly back on our shelves. Whatever it is, we've got chocolate on our minds. To celebrate the return of the uber-rare white chocolate Cadbury Creme Egg, how would you like to win a hamper filled with chocolate goodness? They'll be packed with everything from Easter eggs to Cadbury Mini Creme Eggs, which will satisfy just about any sweet tooth. All you have to do to be in with a chance of winning is find a white chocolate Creme Egg right here on JOE.ie. Keep an eye out for one of those delicious eggs on our site, and send us a screenshot of where you spotted one. Everyone who sends us in a screenshot of where they found a white chocolate Cadbury Creme Egg will be entered into a draw to win the grand prize. Just in case you've forgotten, that prize is a Cadbury hamper worth €75. That is a hell of a lot of chocolate, and we have a few of them to give away. White chocolate Cadbury Creme Eggs are back! Join the hunt to find one of these eggs-tra special bundles of chocolate joy in stores nationwide to be in with a chance of winning cash prizes!